Warden Woods Community Secondary Plan – Bousfields Inc. Working with both The Goldman Group and the City of Toronto, Bousfields was retained to secure approval for an Official Plan Amendment and a rezoning to provide for the redevelopment of two former industrial properties and the former Warden Woods Campus of Centennial College as part of a planned community with supporting facilities and services. 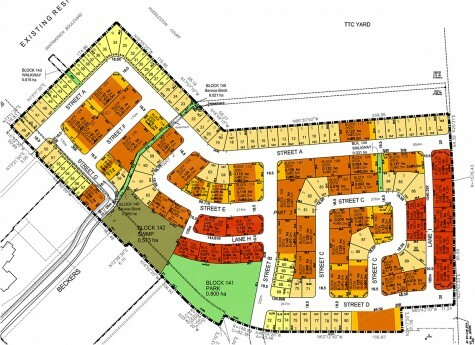 The proposed redevelopment provides for a total of 896 residential units on over 22.5 hectares, and includes a mix of detached, semi-detached, townhouses and stacked townhouse units, and a centrally located neighbourhood park. Bousfields prepared a Planning Rationale, the Draft Plan of Subdivision and a Community Services and Facilities Plan in support of the Official Plan Amendment and rezoning. Bousfields worked with City of Toronto staff, the developer, the community and the industrial landowners to produce a Secondary Plan to guide the evolution of the location from a predominately industrial area to a residential community. While much of the community has been completed, other vacant properties within the Secondary Plan area continue to be developed.